We did some fabric shopping at Joann’s in Roseburg, Oregon. 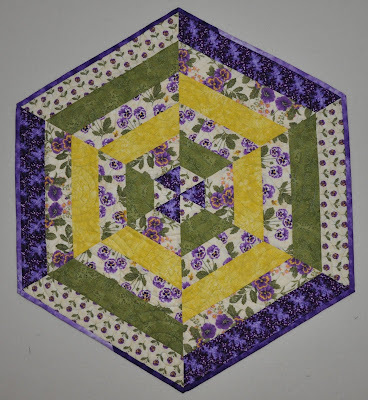 I fell in love with a fabric collection by Debbie Mumm that featured pansies. Pansies are a flower that links the women in my family. Pansies were a favorite flower of my grandmother, my aunt, my mother, and myself. My grandmother painted pansy pictures for each of us and I always think first of my grandmother when I see pansies. I recently finished four projects from the pansy fabrics. The first piece was a table topper that was gifted to my aunt for Christmas this past year. The second piece in the pansy series was a Disappearing Nine Patch that was gifted to my Mother this past Christmas. 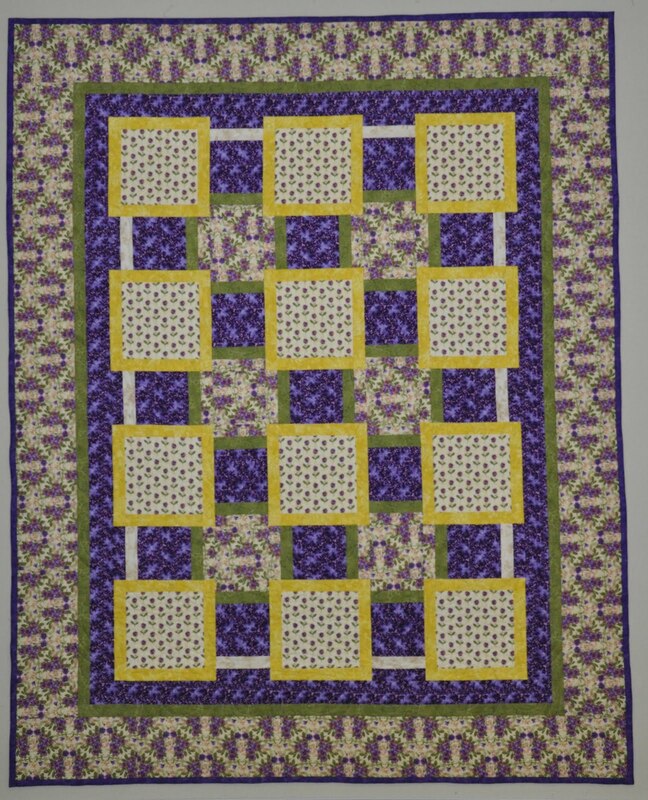 The final two pieces in the series were a lap quilt and table runner for myself. I am so finished with winter and I am so ready for spring. Rather than put the table runner away until the weather improves and spring actually arrives, I decided to put it out now. It may not be spring outside, but I can make it feel a little like spring inside. The road trip I mentioned above was where I first met two of the FABs in person–Cher and Pam. 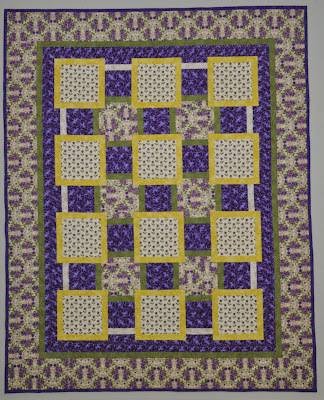 So in honor of this meeting, the backing fabric for all of these pieces is purple. After all, purple IS the FAB colour! These four pieces bring together a lot of symbolism–pansies for the women in my family and the two FAB sisters I met in Oregon that have become such an important part of my extended family, purple to celebrate all five of the FABs which includes those that live in WI and AL, and a wonderful memory of a girls only road trip. While in Oregon, my mother spotted the perfect fabrics with lilacs on it. She bought enough for me to make three table toppers–one for my aunt, one for me, and one for herself. I managed to finished the topper for my aunt in time for her to take it back with her to Saskatchewan. A week ago I finished my mother’s. 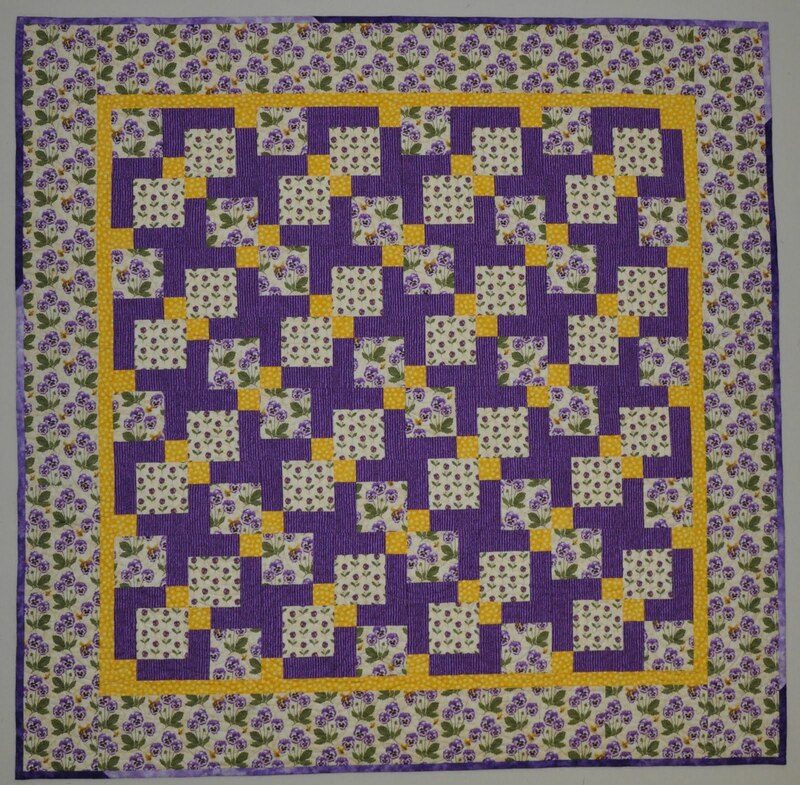 This past week, it has been very busy here–i finished quilting 7 customer quilts from Monday to today. I am now officially caught up–at least for a couple of days. I am anxious to work on some of my own projects in the next few days. My mother and I have been tossing around the idea of a road trip to Oregon for some time now. We have always talked about it, but we never put the plan into action. One night in April while visiting over coffee, we once again started talking about going to Oregon. “We should just head down there sometime,” one of us said. I pulled out the calendar and said we should just plan it, book it on the calendar, and do it! My aunt (my Mom’s sister) was due out for a visit from May 13 to 28. I suggested we wait until she was here to make the trip. That way she could be included. The Canadian long weekend was during the middle of the time my aunt was going to be here and that would work into my work plans since I would be off work for the long weekend anyway. The planning started. We would leave Saturday morning (the 17th) and plan to be away for 5 days. I only needed an extra two days off work to make this plan happen. My Dad quickly asked if he had to go along. He hasn’t been feeling 100% health wise and travel far from home was not likely a good idea for him so we said he didn’t have to come along. My husband quickly chimed in with his request for an exemption from this excursion. Granted! This would be a”Girl’s Only” road trip! The three of us (my Mom, my Aunt, and myself) left home early Saturday morning. We expected some heavy traffic crossing the border as Saturday was the kick off to the Victoria long weekend here in Canada. We thought if we left as early as 6:30 am, we would beat the long line ups at the border. However, that same weekend, the news was carrying stories of construction at the Peace Arch crossing. The news reporter was recommending that folks consider alternate crossings to avoid the heavy construction delays. I think all those people headed to the Sumas crossing where we were, because when we arrived at the crossing at about 7:15, the line up was long. We waited in line for approximately 1 hour before crossing the border into Sumas, Washington. That was only the first delay we experienced. Just north of Bellingham we encountered an ongoing road widening project where traffic slowed. As slow as that traffic seemed to move, it was nothing like what we experienced trying to get onto I-5 at Bellingham. We had to go under the freeway overpass and as we looked up onto the freeway, we could see that the traffic was just parked–not moving at all. Because we were stopped and waiting our turn to enter the freeway, we had time to check out the licence plates of nearby vehicles. You would have sworn that we were still in Canada–not an American plate to be seen! I think all our neighbours had decided to head south with us. At this point, I thought maybe heading south this weekend was not such a great plan. We had places to go and things to see. We didn’t want to spend our weekend in heavy traffic! After about a 1/2 hour delay, we were finally moving at a decent speed. The Canadian plates continued to travel with us to Seattle making for heavy traffic, but as the day progressed, we saw more and more American plates and our Canadian licence plate became the minority. We did pretty good with directions (can’t go wrong heading south on I-5) until we got into Seattle. Somehow we ended up in the commuter lane and we ended up on an off ramp taking us off the freeway. After some panicked conversation between my Mother and I and my frantic map reading trying to figure out exactly where we were, we realized that we were on another highway that actually runs parallel to I-5. We proceeded along until we reached a point where we could merge back to I-5. Whew! The whole time, my mother was relaying horror stories of a prior trip when she was last lost in Seattle and she got into a section of Seattle that looked a little less than friendly. The last thing we needed was three women lost in Seattle–ending up in a part of town that we shouldn’t be in! Because the I-5 corridor that we were travelling to Oregon on would pass directly through one of the communities where one of the FABs lived, we had made prior plans to stop and meet for coffee. We stopped and met Cher: http://cherzoe.blogspot.com/ in Portland at the cutest little neighbourhood cafe, Marco’s. If you are ever in Portland, this is definitely worth a stop. Check out their web page at: http://www.marcoscafe.com/ Marco’s is located in the most charming little community called, Multnomah Village, “The village in the heart of Portland”. 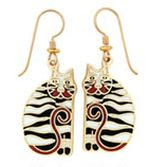 Check out some of the wonderful shops available: http://www.multnomahvillage.org/joomla/. Cher brought along the quilt that I quilted for her so that I could see how it looked bound and ready for use. Cher also gave me this wonderful little package. 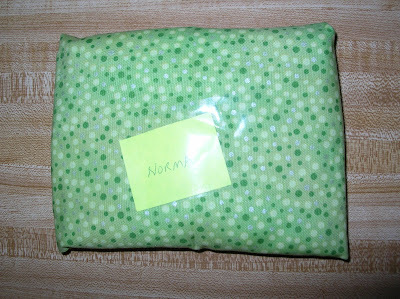 Any package wrapped in fabric–especially green fabric has to be wonderful. 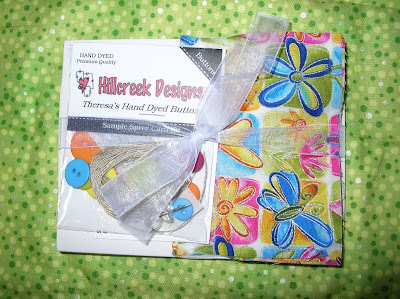 Inside was a kit to make cards complete with hand dyed buttons and colourful fabric. 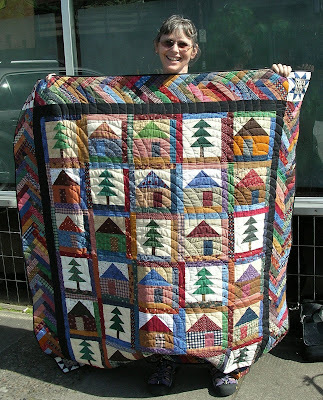 Cher had the privilege of working during Quilt Market in Portland and was able to attend the portion of Market where you can make purchases from the vendors. She had picked up these cute little kits at Market for each FAB member. How considerate of her! We proceeded down the highway to Salem. We were now hot and tired and looking for a room. We found out after stopping at a couple of motels that there was a horse show in town and most of the available rooms were taken. We ended up getting a room at the Comfort Inn. The room cost was a little pricey but it ended up being the best room we had on the whole trip. The pillows and bed were so comfy! The room was clean and spacious. Once settled, we headed out to find somewhere to eat and of course do a little shopping. We quickly established the tradition of shopping in Wal Mart in the evenings on our trip. 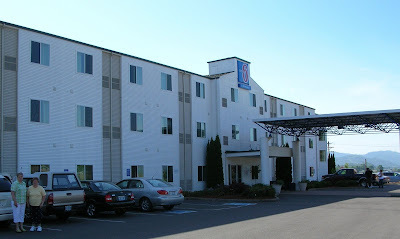 The gal in the motel told us there was a Wal Mart on just about every corner in Salem, and I think she was right. I think this was an easy statement for her to make because I think I saw a Wal Mart in almost every community in Washington and Oregon that we passed through–irregardless of community size! The next day we didn’t have too far to go to get to our destination in Roseburg, so we stopped for some tax free shopping in Springfield. I have decided that my favorite store in the U.S. is Kohl’s! 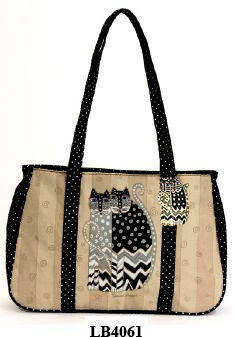 We found clothing and purses at excellent prices in Kohl’s–http://www.kohls.com/kohlsStore/homepage.jsp. I also found the most wonderful watch with lots of bling in the mall there. Every trip deserves a souvenir watch purchase, don’t you think? 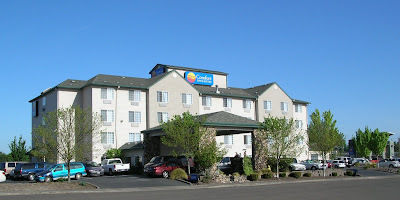 After shopping in Springfield, we headed further south to Roseburg. 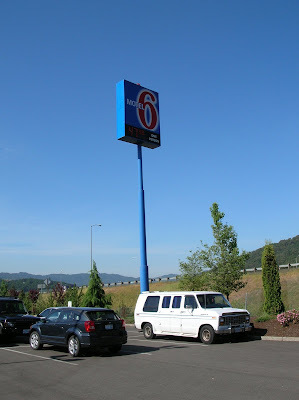 We stayed at the Motel 6 in Roseburg. This motel is fairly new and very clean. The room was smaller than what we had the previous night, but less than half the price of that room too! Once we settled in, I phoned, Pam: http://mycreativemind.pamgwillim.com/ . Pam was shopping nearby and came and met us at the motel. Look at that gorgeous blue sky! The weather was wonderful on the first part of our trip–warm (the thermometer in the vehicle had a reading of 36 C outside)and sunny! 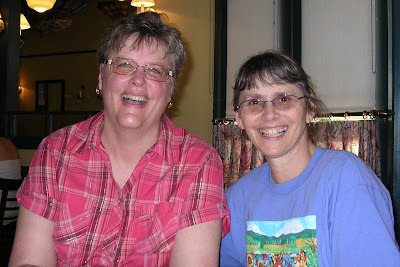 Pam is the second member of the FABs that I have now met in person. Pam doesn’t live in Roseburg. She lives an hour drive away but agreed to meet us in Roseburg. 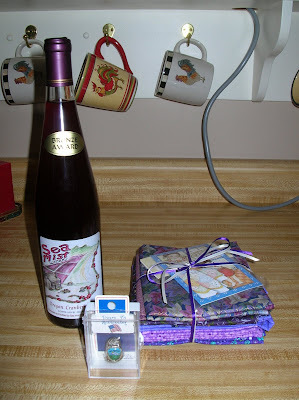 Pam came bearing gifts–wine from the local winery, Sea Mist Winery in Bandon, a thimble bearing a picture of Mt. Hood (I loved the story about that one, Pam! 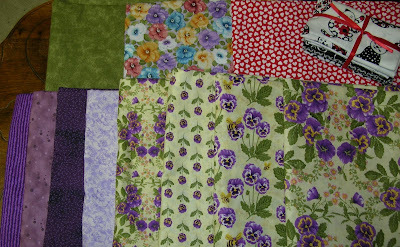 ), and the most wonderful packet of purple fabrics. After all, I was in danger of loosing my membership in the FABs without purple fabric in my stash. Thanks for looking after my membership status, Pam! Pam took us all to JoAnn’s where I found all these wonderful fabrics. My mother even purchased some cute watermelon and lilac fabrics with coordinates so that I can make table toppers for the three of us. The fabrics purchased above were my purchases. 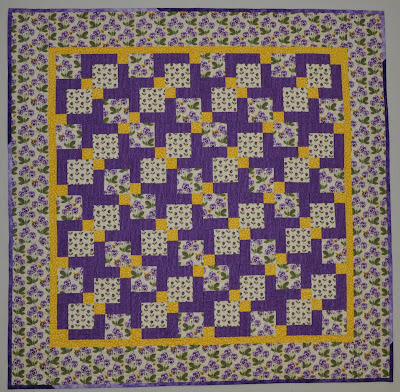 The pansies were from a Debbie Mumm line of fabric that I fell in love with and the purple purchases were to further enhance my newly acquired purple stash. The red and white fabric is left over from Valentine’s Day. (We can’t get fabric for Valentine’s Day in Canada. Pam had sent me a package of Valentine and Easter fabrics earlier this year. I plan on making something for both those occasions for next year.) Pam must think we are fabric starved in Canada. I was ecstatic at the selection of fabrics at JoAnn’s. 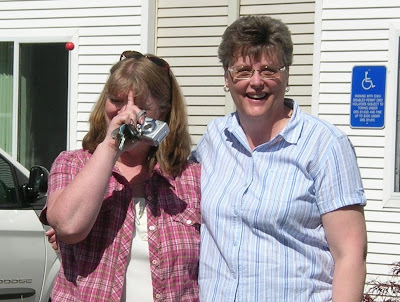 This was when, Pam told me that I HAD to go to Fabric Depot in Portland. If I thought the fabric at JoAnn’s was wonderful, I HAD BETTER STOP in Portland on the way home. Of course I can take direction very well, so we stop at Fabric Depot, but more about that later in the next post. We also visited Michael’s. Although all three of us scrapbook, my Aunt holds the crown. My Aunt’s scrapbooks are not years behind in completion like mine! 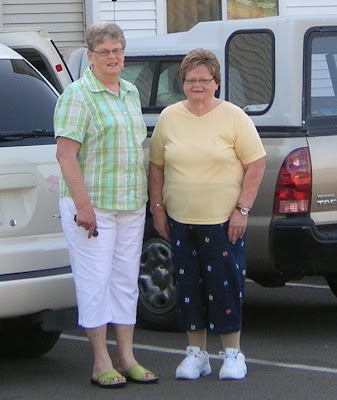 This is a picture of my Mom and Aunt in Roseburg the following morning (Monday). 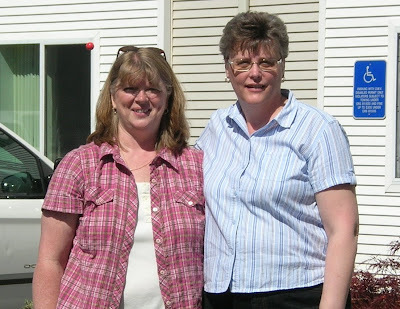 (My mom on the left and my aunt on the right). As you can see, we are well rested and ready to shop! We stopped at the local mall in Roseburg where we found the most wonderful Hallmark shop. All three of us came out of there with packages! This is where I found my Laurel Burch purse and earrings.